The Southern Glossary Instagram account is curated by a new artist or photographer each week. Every curator will put their own spin on the account, showing off work, their process, and their surroundings. Here's a Q&A with last week's curator, photographer and writer Shaun H. Kelly. In college I had the opportunity to travel to Kenya. I bought a camera from a friend because it was the first time I had traveled off the North American continent. I took way too many banal photographs of landscapes and animals. Later, I had the film processed at Wal-Mart. The ladies who worked at that lab hated to see me coming with my hundreds of rolls of film. I still take banal photographs today, just fewer animals. But my trip to Kenya made me realize I value the photographic process. I feel it's more than what makes someone an artist. Geography makes us who we are as people. I was asked to join a collective a few years ago. The members are all across the country. I had my hesitations because I didn’t see the purpose. The group was essentially fellow photographers who wanted to support each other and each other’s careers. I see nothing wrong with that, but I declined being part of the collective. Unfortunately, I think I offended a friend in the process because I perhaps too pointedly addressed my hesitation by asking why we needed to be a collective. If I knew of an opportunity that I thought was good for one of these friends, why couldn’t I just call and tell them about it? I think when you make calculated efforts to define what should be ordinary, whatever that thing might be loses pleasure and the intent becomes making it work more than it does being what it is. It becomes difficult to manage. 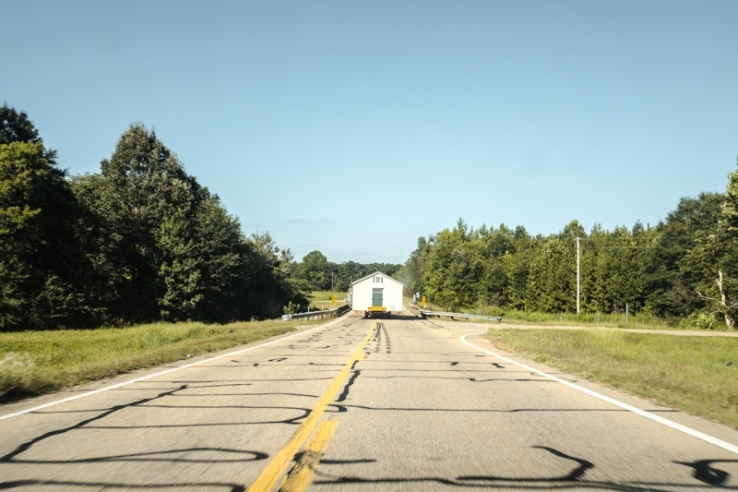 William Christenberry in Working from Memory talks about time spent with Lee Friedlander, Walker Evans, and William Eggleston. But the closest thing he ever mentions to something like an artistic peer group is showing Friedlander around Alabama and taking pictures along the way or sitting at a laundromat talking with Eggleston. Everyday conversations with my wife, coworkers, and friends unintentionally function as what I think you are getting at when you say "artistic peer group." I understand the hopefulness in wanting a peer group. The dialogue is healthy. But if there is anything wrong with contemporary photography it’s that we are trying too hard to define what we are doing. I don’t have a system per se. I’ve got some blogs that I follow but it seems more like what is expected than inspirational. I do go to see exhibitions. But I probably respond best to those things that irk me, like perpetuated stereotypes in the South. I vocalize it to my wife then I go make photographs. And, really, that isn’t even as systematic as it sounds when explained. It’s much more arbitrary, and I don’t necessarily recognize it as inspirational, which is why I have dresser drawers full of random scraps of paper with ideas written down because I didn’t expect to arrive at those thoughts in that moment. There’s a conversation about problematic things then there is a conversation with the camera, that’s all. Never. If I were creatively satisfied I’d be a banker and unsatisfied in another way. But at least I’d have more financial security. I just moved back to Mississippi after having lived in California for six years. I’m in Oxford, which is not where I grew up. So I am trying to meet people but like I said earlier, it feels too calculated. I was in a group exhibit in New Orleans recently, The Blue Library curated by Tammy Mercure and for that opportunity I am very grateful. I got to share work from Overgrown South. Currently however Strant Magazine, of which I am the founder and editor, has an open call for the next issue. Strant is not an explicitly Southern publication. However, the focus is on themes strong in the South. The forthcoming issue is on Faith. It will be the second of four issues this year, which will initially be published online and then later, all four issues will be compiled and printed as an end of year publication. Info about the open call can be found here.